Thread: Paper Piecing- When do YOU remove the paper? 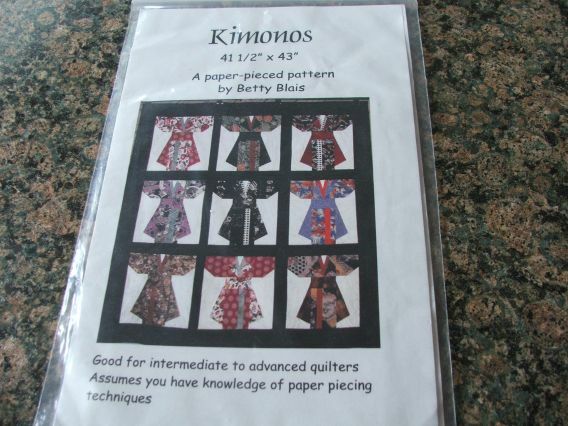 Good Morning, I'm working on paper-pieced blocks from Betty Blais' pattern, Kimonos. I was thinking about this all night and finally decided that I should ask all of you this question. When should I remove the paper on the back of the blocks? I haven't trimmed the blocks down to size yet.....and I know that with paper piecing the fabric grain goes in all kinds of crazy directions. If I remove the paper before trimming, there probably won't be as much distortion later. The paper is holding everything in perfect shape at the moment but when I quilt it there might be more chance of it not laying flat if I wait to remove the paper till the whole quilt is put together. What do you think? I have 4 more blocks to go.... 20 total to make this a bed quilt instead of a wall hanging. Since I started this 5 years ago, I'm wanting to get it done and off my UFO list. I paper pieced the Farmer's Wife Pony Club quilt--all 90+ blocks. I removed the paper after each block was completed. I kept them on my flannel design wall so they'd stay nice and flat. When it was time to sew them together, there was no distortion even tho a lot of edges were bias or off-grain. I also pp a Storm at Sea wallhanging and didn't remove the paper until the whole thing was sewn together--what a night mare that was! It took forever to get the papers removed and was much more difficult. The results were the same-no distortion but for me, I'll remove papers after each block is complete. That's an adorable pattern and l love your block. Like JanRN, I PPd the FWS, also the PC (which JanRN also did!). I press the block, as I do each seam, trimming the seams as necessary. For the outside pieces, I always extend them beyond the seam lines marked on the paper. After all the piecing is done, I remove all the papers, and press again, with a shot or two of Best Press. Then, I do the final trimming for the outside ragged pieces, and square up accordingly. Like JanRN, all stays nice and firm and square by removing the paper as you go. Besides, I wouldn't want the long drawn out task of removing all the papers from the whole quilt. It isn't much of a job when doing it as you go. I'll look forward to seeing all of your Kimonos together! It must have been a fun quilt to do. i don't have to remove the paper as I use the fold back method of paperpiecing... love it! Beautiful block!! I remove the paper at the very end - or once a block has been attached and completely surrounded by other blocks/borders. I like to keep the 1/4" seam allowance around the outer edges for accuracy. It may not be necessary but it gives me a guide and some reassurance that I'm putting everything together correctly! I remove my paper as I finish a block. It would not be a fun job to wait and do them all at one time. I understand there is a new wash away kind of paper that you can run through your printer...haven't tried it yet. I've never heard of this method. Is there a tutorial somewhere? I leave the paper on until all the blocks are joined together. There's too much risk of stretching a block, or some part of it, if the paper is removed before all four sides are secured by stitching to the next block/sashing/border. I am interested in this to. I am interested in learning this way to. Like JanRN and QuiltE I also PP'd the Farmers Wife and Pony Club quilts, 201 blocks in total (I think) I always remove the paper when I finish a block and if I need to align seams that maybe on an angle I will draw my 1/4 inch seam line on the fabric. I also remove the paper if I have to sew sections together as I loathe removing the paper from within a seam line. If you press well and use a little starch on your blocks you should not have any distortion but if you are worried you can sew a small line of stitched around the block. Hope this helps and I love your pattern.. I wait until everything's sewn together. I don't remove the paper until the quilt is ready to sandwich. I press & trim the block with the paper on it (no steam as it may shrink the paper) Then once the block is stitched into the quilt top I remove the paper. (I use a 1.5 length stitch & regular paper, just fold along perforations & the paper is easy to remove) The stay stitching on the quilt top edge keeps the blocks along the edge that are paper pieced from getting stretched. The only time I would leave the paper on a block is if I have to join it to another block and match the seams of each. If you're going to sash the block, or if the block doesn't have matching seams ... I would remove the paper when the block is done and store the block flat. It was interesting to read all the suggestions - I have a paper pieced project to do at some point so enjoy all the tips and tricks. Sounds like no set rules but personal preference. I keep paper in until ready to press block.ready to join to next one.as seam mark is on that paper.if moving pieces about will also help to hold steady. I thought I was going to be really smart and stay-stitch my string-pieced squares 1/8 inch from the edge. Then I sewed the units together with a 1/4 inch seam. Not one of my brightest ideas. It was a major hassle to pick those bits of paper off the edges! I picked the pieces of paper off after sewing the units together. The fold back method pf piecing is great! Thanks everyone. It sounds like it's a personal choice. I guess I'll remove the paper before I put it together..... I'll press and trim to size. All your suggestions were great. And I love that fold back method to paper piece. I'll have to try that on the next project. The only thing I wonder about is if you can put freezer paper in the printer. I don't think I want to hand trace all the paper piece patterns. 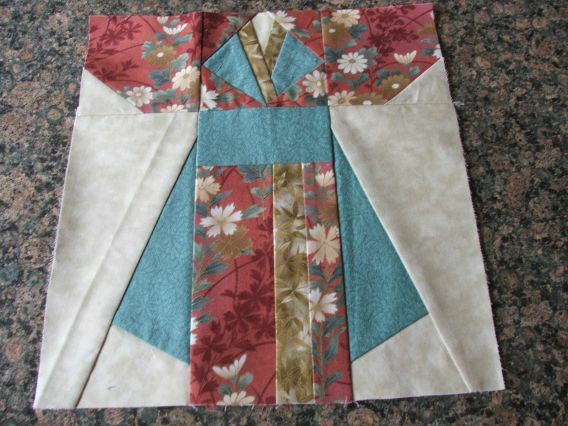 The kimono block has 4 separate parts that get sewn together at the end. That would be 80 pieces of pattern to trace..... too much. I did hear someone say that they bought freezer paper in a regular 8 1/2 x 9" sheet size. Have any of you seen this? I use the Carol Doak's method, I don't remove the paper until the whole quilt is together. I removed the paper after the top was pieced - yes it was a pain to remove all the little pieces between seams. I have purchased Ricky Tims Poly Stable Stuff for paper piecing for a project about 3 down the list, you leave it on and when washed, it turns to fibers. I have handled a PP quilt this was used in, before & after it was washed...I think I'm going to love using this!